Who buys postcards of buildings anymore? Actually, do they even make postcards of buildings anymore?! Well in the last century they appeared to make one of almost anything made with bricks and mortar. Perhaps it was because Mid-Century building design was simply more iconic and/or novel than today. Whatever the reason I find that these long lost postcards capture a haunting, often futuristic mood that even staring at the building in reality (if it were to still exist) wouldn't quite provide. This selection of scans convey how the photography and image capturing techniques of the era conspired with the design it was documenting to create a beautiful distortion of reality. Federal Building, Los Angeles, circa 1942. The modernist late Deco lines of the building (designed by Gilbert Stanley Underwood and and Louis A. Simon) take on a more sinister sense of style and mystery thanks to the quality of the vintage B&W film. Ok this mock film promo by artist David H. Lambard is a more contemporary image, but is still evocative nonetheless. 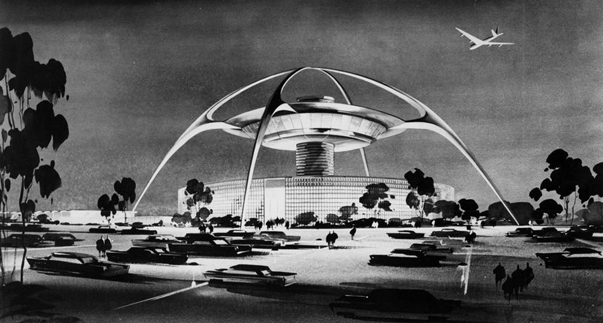 A promotional card for the Theme Building at Los Angeles International Airport, circa 1961. The B&W illustration helps to accentuate the Space Age spirit of the design. Modernist tower at the 1933 Century of Progress World's Fair, Chicago. Federal Building at the 1933 Century of Progress World's Fair, Chicago. Moderne tower at the 1933 Century of Progress World's Fair, Chicago. Theme Centre (Trylon and Perisphere) at the the New York World Fair, 1939. Citizen's State Bank, Oklahoma, built in 1958, this Atomic-era landmark on Route 66 has fought off all kinds of threats of demolition. I felt the colouring of the original postcard detracted from the design so I bled it out to emphasise the killer Gold Dome. Executive Inn, Standiford Motel, Louisville, Kentucky. Again the original colouring of this motel lobby postcard was a sickly hue of orange. I bled out the colour and re-coloured the seat covers & water feature to fit the Computer Black aesthetic. I really love the diamond motifs and the glass brick walls (a real obsession of mine). Fountain Of Planets, New York World Fair 1964. Idlewild (JFK) Airport Arrivals Building, early 1960s. Some postcards completely dispensed with any notion of reality as these cards from the 1939 New York Fair reveal.